It will be China's first launch since December 29—China's 39th and the world's last of 2018—and first by any country in 2019. SpaceX could follow with the Falcon 9 Block 5 launch of the Iridium NEXT 66-75 mission on Friday. China's first three launch sites were established during the Cold War, with Jiuquan and Taiyuan constructed deep inland for security reasons. These included tensions with the Soviet Union spilling over into border skirmishes and the United States considering preemptive strikes against China on sites linked to nuclear weapon launch capabilities. China has not yet released an overview of its launch plans for 2019, but major missions are expected to include the return-to-flight of the Long March 5 (now Q2) and subsequent Chang'e-5 lunar sample return mission using the same heavy-lift launcher late in the year. China smashed its record for orbital space launches in 2018 to boost the country's rival to GPS, help commercial companies take off and set a course for the far side of the Moon. CASC, the main Chinese space contractor, stated at the start of the year that it was targeting around 35 launches and finished with 37, all successful, with the Chang'e-4 lunar far side mission as the standout. The failure to launch the flagship Long March 5 heavy-lift launcher remains grounded despite expecting a return-to-flight late this year means a potential bottleneck approaches, with a successful launch key to moving ahead with several major space plans, including the Chinese Space Station project, Chang'e-5 lunar sample return and a first interplanetary mission—to Mars—in summer 2020. Liftoff of the enhanced Long March 3B launch vehicle occurred at 17:11 UTC January 10 (01:11 Beijing time, January 11) at the Xichang Satellite Launch Centre in southwestern China. People's Liberation Army Daily, a military newspaper, confirmed success of the launch 70 minutes later. 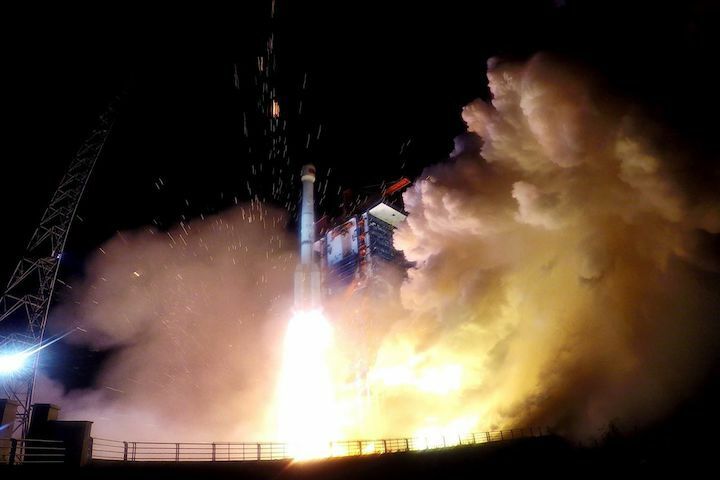 Little is known about the payload, also known as ChinaSat-2D, which was described tersely by Xinhua as a Chinese-made communication and broadcasting satellite designed to, "provide transmission service for the country's radio, television stations and cable television networks." Nasaspaceflight.com meanwhile notes that the satellite may belong to a second generation of communication satellites for military applications. The satellite is likely based on the DFH-4 communications satellite platform developed under the China Academy of Space Technology (CAST) under the China Aerospace Science and Technology Corporation CASC), the main space contractor. Another institute under CASC, the China Academy of Launch Vehicle Technology (CALT), developed the hypergolic, expendable Long March 3Brocket used for the mission. The Long March 3 series will soon be in action again at Xichang as China continues its push to complete its Beidou navigation and positioning system, a rival to GPS of the United States. A Long March 3B early last month launch the Chang'e-4 lunar lander and rover, which touched down on the far side of the Moon on January 3. China has not yet released any indication of the number of launches it plans to carry out in 2019, which will follow on from a national record 39 times(including one failure) last year.